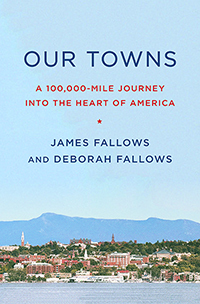 James and Deborah Fallows, University of Redlands distinguished fellows and honorary degree recipients, will be speaking at the University on Wednesday, May 16, 2018, as part of a national tour for their new book, Our Towns: A 100,000-Mile Journey into the Heart of America (Pantheon Books, 2018). The Fallowses' upcoming book describes what they saw in 30 cities across the country, including Redlands. Divided into chapters alternately penned by James, a long-time national and international correspondent for The Atlantic, and Deborah, a linguist and writer, the book describes what they saw in 30 cities, including Redlands. Redlands is not only James’s hometown, but also the place where, on the University of Redlands campus, they wrote the book. The five-minute amble from Citrus Avenue along Fifth Street to East Redlands Boulevard is irresistible. Between the A la Minute ice cream shop and Parliament Chocolate is Augie’s Coffee House. Austin Amento, along with his father, an electrical contractor, brought Augie’s a small coffee shop, about five years ago. They didn’t know much about the business but saw an opportunity in an uncertain economic climate. After a few years, they decided to go all in, to ramp up. Their mission and brand would set them apart: finding the best coffee beans; controlling every aspect of the bean roasting, the coffee brewing, and the costs; creating a new ambiance for the customers. 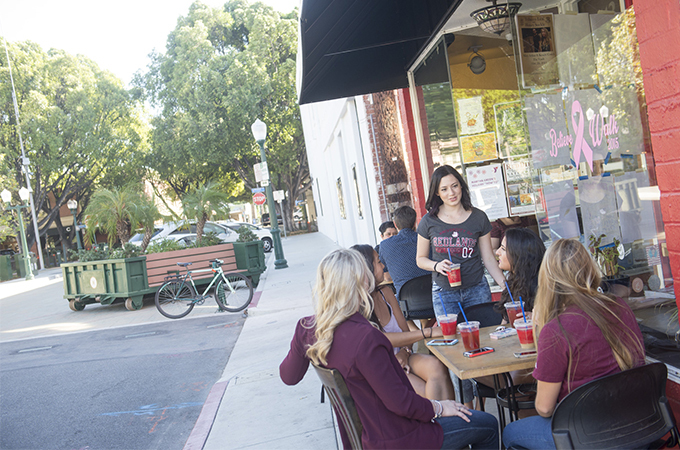 From ice cream to chocolate to coffee, microbreweries—including the granddaddy of them all, Hangar 24—and sandwich shops and small boutiques, Redlands is peppered with inventive start-ups and charming options. A lot of the loveliest classic buildings will never return, having given way to “modern” buildings of the 1960s and 1970s. But others show promise in preservation. Today’s Starbucks is in a building preserved from the beloved former La Rosita drive-in. The old Redlands Daily Facts building will be the site of the new Museum of Redlands. Soon to follow, everyone hopes, will be the redevelopment of the failed downtown Redlands Mall, now a deserted enclosed 1960s mall that serves the community only with its big outdoor parking lot. We heard that the plan calls for a mixed-use complex: street-level retail plus upper-story condos, a renovation model we met all across the country. Then there are new markets, talk of a train, biking routes already in place, and the protection of groves and green hills. Register for the May 16 book tour event—which will be moderated by A.K. Smiley Library Director Emeritus Larry Burgess, with an introduction by Esri founder and President Jack Dangermond. The event will be held at 8 p.m. in the University’s Memorial Chapel. General admission is free. Also available are tickets for VIP seating, which include a signed copy of the book and special reception.